The 82-room Hampton Inn and Suites Houston-Westchase is in the Westchase business district near the Galleria Mall and provides quality affordable accommodation for both the business traveler and the vacationer. Items included with the room rate at this non-smoking hotel are a hot breakfast buffet or breakfast to-go bag, high-speed Internet access, local telephone calls, in-room coffee and parking. There is one meeting room available for business or social functions that can accommodate 50 guests. Area landmarks and attractions include the Museum of Fine Arts, the Contemporary Arts Museum, behind-the-scenes tours of the NASA Johnson Space Center, the Battleship Texas and the San Jacinto Monument and battleground. 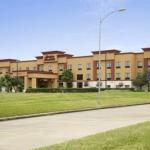 The hotel is also close to several golf courses, Memorial Park, the San Jacinto River and Lake Houston. The rooms and suites come with a choice of one king size bed or two queen size beds. The amenities include a work desk with high-speed Internet access, coffeemaker, hairdryer, iron and ironing board, two telephones with voicemail, speakerphone and dataport, easy-to-set alarm clock and television with cable news and movie channels and pay-per-view movies. Handicap accessible rooms are available. This hotel has an outdoor swimming pool, whirlpool and a fitness room. The 24-hour front desk has safe deposit boxes and information on area events and attractions. Other amenities include a business center, guest laundry, daily housekeeping and ice and vending machines. The complimentary breakfast is the only meal served here. Restaurants nearby include the Red Onion Café, Cheddae, Ninfa and the Lucky Village.